Human settlements have integrated public spaces as an extension of the dwelling unit and community living. While some spaces have religious importance, the others possess political power, commercial traces, leisure and recreational and ecological dimensions. Public spaces manifesting lifestyle and ethnic Indian culture have taken shape in the form of lakes, bathing ghats, public gardens, sacred groves, step wells, temple tanks, public grounds, libraries and community halls, etc. Traditional planning systems that respected climate and the cardinal directions, nature with its green and blue grids can be traced from the early times when man worshipped nature and human settlements were transposed on the eco grids . Historically, settlement of Bhuj city is such classic example where public spaces form an integral part of day to day life and activities. Amongst these, lakes have always been a very important and necessary element of human settlements around the world, through ages. They were a major source of water, as well as formed a vital community space for the settlements. They often held a religious importance for the community. However, with the advent of industrialisation and piped water supply, slowly the settlements turned their backs toward these lakes. Now often the urban lakes are filled-up to get more land for construction, or are used as dumping area for garbage and sewage. However, due to unplanned urbanisation has adversely created pressure on these public spaces in order to meet ever-increasing development needs of the urbanites. The rampant degradation of urban lakes has become a common story around the country. One of the major reasons for it is the false belief that the lakes have become irrelevant in the urban context, and their usefulness is slowly getting forgotten, generally limited to waste dumping. There is a need look back towards these lakes as a valuable resource for the cities, instead of turning our backs towards them. The several important functions of these lakes need to be acknowledged and conserved, making them more useful to the citizens as well as birds and animals. 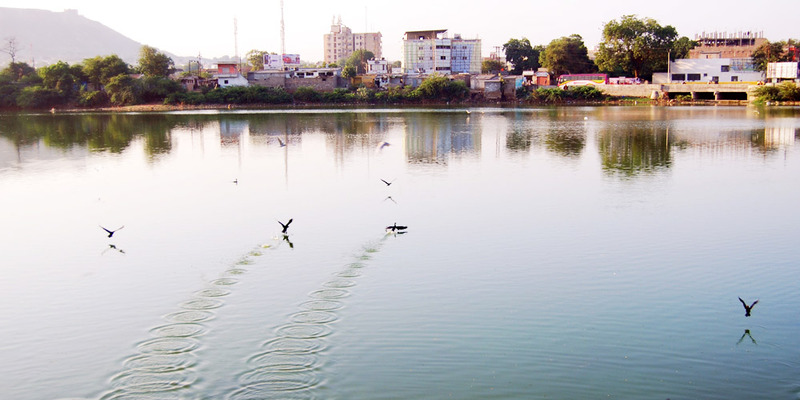 It would be surprising to know that earlier there were 83 lakes in the Bhuj city but in 2011 there were only 43 lakes recorded in the city (ACT 2011). However, this number is continuously decreasing. In order to rejuvenate the entire ecosystem as well as to rebuild its recreational value, Desalsar, one of the prominent lakes in the city, is selected by Hunnarshaala Foundation for Building and Technologies for rejuvenation through design and hydrological interventions. This is an attempt to create a model that can be replicated to conserve other lakes in the city. 1. Dichotomy of Urban Public Spaces – “Timeless or Ephemeral” – The Indian Experience by Priya Sasidharan & Prof. David .C. Prosperi, CEPT University, MEASI Academy of Architecture, Florida Atlantic University, India, U.S.A.